Some of us hope to get some gaming in this weekend, why others probably don't have a shot. If there's one thing in common it's a sudden renewed interest in Madballs in...Babo Invasion for the PC. Funny how that happens. Nick "bapenguin" Puleo - "I'd like to finish Bayonetta or Army of Two: The 40th Day. Possibly even try Kings Bounty: Armored Princess on the PC. But the reality is, I'll be lucky to do one of those." 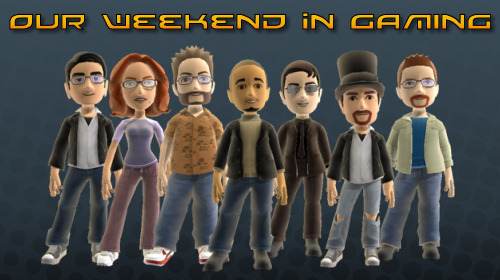 Marc "DjinniMan" Allie - "Our limited playtime this weekend will probably be more Marvel Ultimate Alliance 2 and maybe some Firefight in Halo 3 ODST." Mike "pheriannath" Katsufrakis - "As it stands right now, I don't think I'll be able to play anything this weekend. This is me making the saddest face ever. :-("
Jim "txshurricane" McLaughlin - "I want to check out Madballs in Babo Invasion on my PC, and I'm jonesing for more Extraction mode on Army of Two: The 40th Day - that mode is incredibly fun. I'll probably also lean back on Modern Warfare 2 if there are any gaps, but I expect to be too busy for more than a couple of quick opportunities to play games." Katrina "ShadokatRegn" Pawlowski - "I'll be working with my PC quite a lot this weekend, wrapping up Dawn of War 2, and playing Madballs in...Babo: Invasion. When the console is on, LEGO Batman will fill my life with joy and Lego pieces." Jason "OrigamiPanther" Love - "Mass Effect 2's imminent arrival means I'll be spending some time wrapping up my 2nd playthrough of the game. I also hope to get in some Army of Two: The 40th Day and Madballs somewhere in there."